Natural Cycles In Your Business? How do I know that the cycles influenced these results? Because I consciously planned it that way, using natural timing. The traditional approach to business is heavily focused on logical planning: budget forecasts and deadlines. Having worked as a project manager for most of my career, this was normal for me. But when I left my day job, it wasn’t so straight forward. Logical planning didn’t always work out. I had to take into account my intuition and my creative flow in order to achieve the results I desired. You may have noticed how the full moon affects you or other people; there is a general buzz in the air, and it’s common to feel highly energised, frustrated or a little bit crazy! This is no mistake. The full moon is responsible for high tides the world over, its magnetic pull is powerful. And we, as human beings made of around 60% water, are equally affected, whether we realise the cause or not. High energy = high online activity = high sales. But… the cycle of the moon is only ONE opportunity you can harness. If the moon has such an effect, imagine the cumulative effects of the planets within our solar system and how they influence our behaviour, depending on their proximity to Earth. What do you need in order to get in tune with the natural cycles? First you need to understand the principles that govern the cycles and how they apply to business. Second, you need the tools: you need a calendar that you can use to plan according to the cycles. 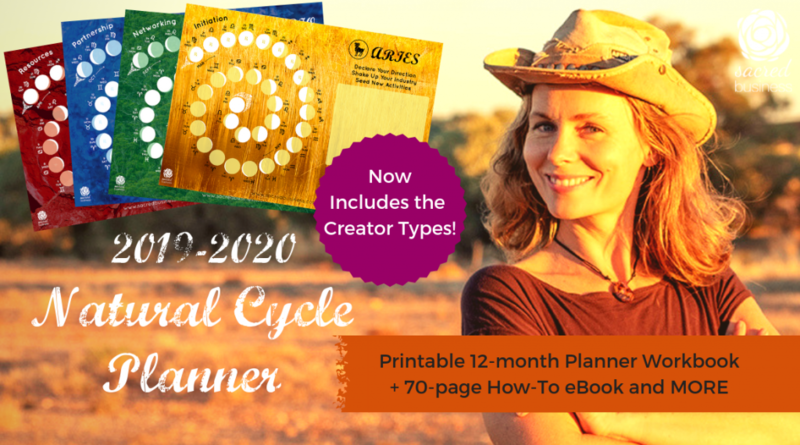 That’s why I created the Natural Cycle Calendar including detailed instructions and PDF fillable and printable calendar months for you to start using the cycles in your business for the coming 12-month cycle. Full colour 12-month calendar, from March 2019 to March 2020. This calendar can be printed, or used as a PDF fillable form on your desktop. 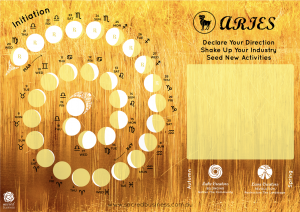 Full colour astrological guide to help you focus your business activities and resources for each month. 80+ page instructional ebook on how to plan your business activities using the lunar, astrological and menstrual cycles. What if… You Used An Unconventional Approach To Business Planning? Using the natural cycles in farming is a given; yet in business, it’s not so common. One is inherently connected with the Earth, the other is not. Using natural cycles in business takes practice, but the rewards can be just as fruitful as they are in farming. 1. The ‘natural’ year actually starts on 21 March, and runs according to the astrological cycle beginning with Aries and ending with Pisces. 2. The ‘natural’ months don’t run from the 1st to 31st, they begin around the 20th to the 20th of each month. 4. The moon cycle is 29.5 days long and during this time it moves through the constellations of the zodiac (Aries through to Pisces). The Sacred Business Natural Cycle Calendar outlines all of these aspects which are significantly different from the traditional Gregorian calendar that most of us live by today. Universal Flow Prevails – Universal energies affect us all; there are periods of high and low energy, and energy that is geared toward certain activities and results. Go with the flow and save time and money. Focus Yields Results – When you focus your energy on certain activities in your business, you get better results, simply by not trying to do everything at once. You also have universal energy putting the wind in your sails at the right time. Abundance Thrives On Flow – Nature operates according to cycles, without these cycles, it would not be able to replenish and renew year after year. Abundant business is no different. This calendar may just be the solution you’re looking for. Yes! You can use the calendar even if you don’t have a business. It applies to any type of work, whether you’re an employee or a non-profit worker. What Is The Natural Cycle Business Planner Worth To You? I’m offering this to you as Pay From Your Heart, which means you choose the amount you wish to pay based on what feels good to you. PFYH is an intuitive process, where you sit in your heart for a moment, appreciate what you are receiving and ask what amount would reflect your appreciation. There is no right or wrong amount, just the amount that feels good. Whatever amount you choose to pay, I will receive with gratitude. Here’s to your natural cycle success!